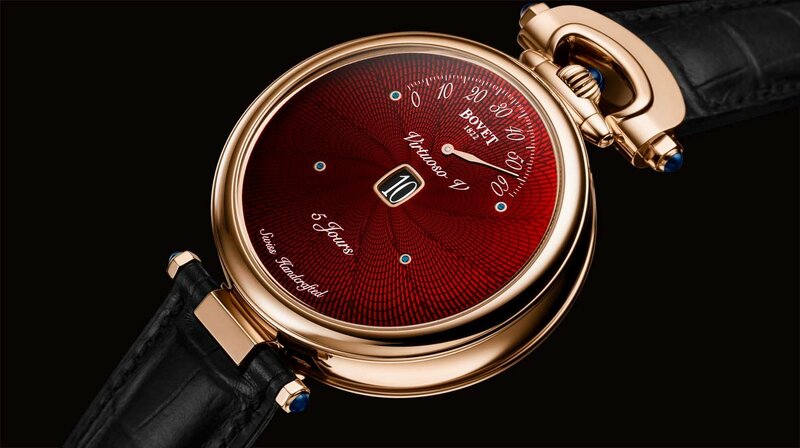 After the blue version, the Virtuoso V is now decorated with a flamboyant red guilloché dial. While the watchmakers worked on displaying all the information on the same level on the dial of the Virtuoso V, the dial-makers designed a completely original guilloché motif. After decorating the metal base with this guilloché motif, they applied a dozen layers of translucent red lacquer, before finally polishing it to give a perfectly flat surface. 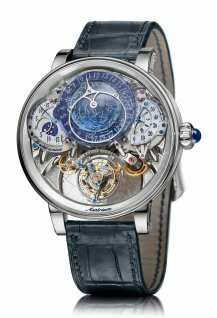 In addition to the concentrated technical skill and artistry emanating from the timepiece, its design has become purer and its readability even greater. The original stepped arrangement has given way to greater classicism, which enhances the artistic crafts and exemplary finishes of all the components. The Virtuoso V integrates two complications that are difficult to combine: jumping hours and retrograde minutes. The jump of the hour disk must be perfectly synchronized with the jump of the minute hand. The hand-wound Caliber 13BM11AIHSMR ensures the chronometry functions of the timepiece. This timepiece belongs to the Fleurier Complications Collection and is fitted with the patented Amadeo convertible 18K red gold case, allowing it to be transformed into a reversible wristwatch, a table clock, or a pocket watch, without the need for a single tool. As a result, hours and minutes can be found on both sides of the movement. 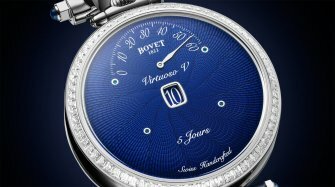 A power reserve indicator completes the indications by displaying a remarkable 5-day autonomy, ensured by the use of a single barrel. A corrector independent of the hour disk can display a different time zone on each side of the timepiece. 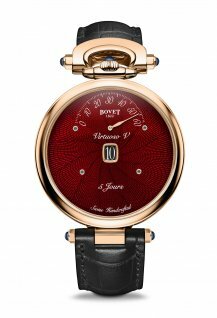 The timepiece is completed with a full skin alligator strap, with red gold ardillon buckle, and with an additional red gold chain. Its price is CHF 68,000. 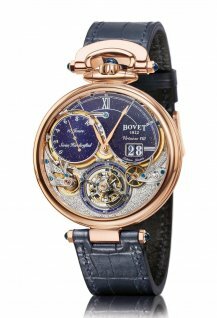 The Bovet Manufacture upholds the tradition of decorative arts applied to its delicately engraved, chased, enamelled, engine-turned or hand-painted cases, dials and movements, thus passing on the unrivalled knowhow that has been gracing the Firm’s collections and heritage since 1822.